Meditation is the conscious act of detaching your mind from the every-day life, memories, and plans. It is about concentrating it on the present moment and forcing it to me mindful of what happens around you. Meditation is about calming yourself but also looking into yourself. It is about learning who you are by observing your mind from above. 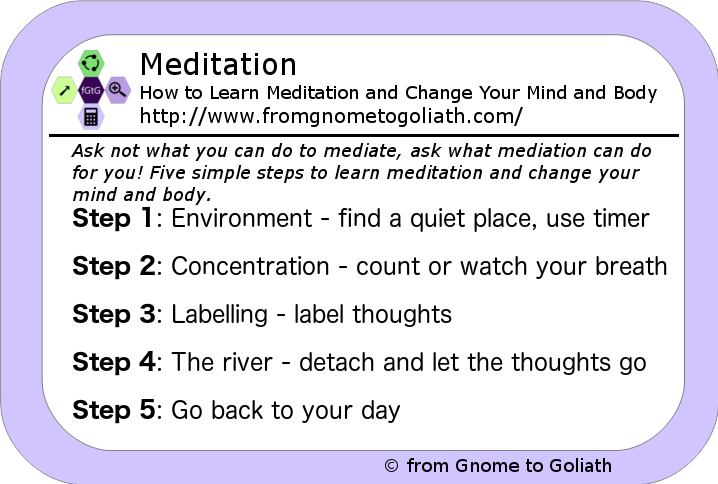 Lists the five steps to learn meditation. Preparing your environment is very important. First of all, you need a quiet place where you can sit or lie down. The less noise and distractions, the better. Be careful with the comfort of the place – you want to meditate, not fall asleep or have a nap. Having a meditation cushion is enough. I prefer to meditate on the ground and have a sofa behind me where I can rest my back at some point. I sit in a close resemblance of the lotus pose, but I am a big man and cannot do a full lotus. It is also important to go to the same place to meditate and turn it into your altar. When you go there you know that you are going to meditate. You should also try to meditate in the same time interval every day. Yes, weekends are not days off. Also, bring a watch and set an alarm to notify you after some time. It will be difficult in the beginning – start with just 5 minutes, or 10. Do not look at the watch and break your concentration. When you feel better, increase the time. Most productive people meditate 40 minutes. I am not there yet, I am at 28-30 at the moment. You are sitting on the ground, your legs are folded, your back is straight, your arms are rested on your legs. The next task is to concentrate on your breath. Pay attention on how the air passes through your nose and mouth. Feel it passing. I usually count each time when I inhale and exhale. I try to keep the air in my lungs for a few seconds. So, it becomes something like: 1 – inhale for several seconds, keep your breath for few seconds, 1 – exhale. Go all the way to 10 and then revert to 1 again. Another way is to count to 4 while inhaling, again to 4 while holding your breath and to 5 while exhaling. I encourage you to test and find what works the best for you. Especially as a beginner, you will notice that your mind still works while you concentrate. You will see pictures, memories, plans will take shape, then you will worry about something. Finally, you will start thinking if the oven is on, or whether you put a hat on the head of your kid. The way out of this is labelling. As soon as you notice that you are thinking and not counting, you label the thought: future, work, plans, past, worry, hope, or even just thought. The process itself is mindfulness – you are being aware that you are thinking. Then go back to your breath. Do not dive deep into any thought. Before you begin the meditation, promise yourself that you will go back to your breath even if you have to do it a million times. And do it! The main purpose of meditation is not only to calm your mind, but also to gain insight. To get to know yourself better. As you meditate, as you are concentrated, imagine a river flowing through your mind. It can be big or small, blue or yellow, normal or magical. Let it flow and observe it from above. When a thought arises, let it develop, note it if it seems important, label it. Then picture it as a poster, let it fall in the river and watch it dissolve and flow away from you. This way you detach your mind from your thoughts and you notice patterns in your thoughts. Do this for every thought that comes to your mind. As soon as you notice you are clinging to a thought, that you are spending too much time on it, let it go as a poster. Let it dissolve in the water. Watch it flow away from you. When you feel ready, take several slow, long breaths. Inhale calmness, energy, positivity and exhale stress, worry, negativity. Open your eyes and go back your day, feeling refreshed and energized. This is one of the many ways to meditate and be mindful. You can think about other methods to improve your concentration if you struggle with that step. Monitoring your breath is the best way though, because that is only rhythmic process that can be both voluntary and involuntary. If you practice meditation even a few minutes a day, you will soon notice the positive impact on your life. Will be more detached from your problems, more concentrated on the present, more mindful of your life.